“We have a surface contact, Señor” called the radar operator to the two pilots from his mid ships console, followed by a track and time to intercept. A gentle left bank and with the River Plate shores of western Uruguay behind we set a southerly heading towards our neighbor’ waters, staying on the deck at 50 ft to avoid detection.The afternoon summer sun behind us bathed our practice target in golden light tones: a ferryboat, inbound to the Argentine capital Buenos Aires. We proceeded head on to visually inspect the fast cruising catamaran, sailing close to 50 kt, the ideal target to “buzz” over. 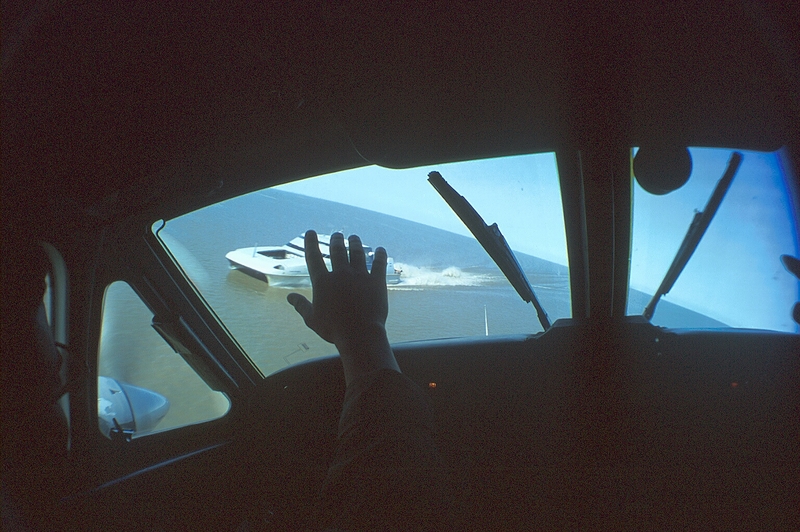 Drawing closer, the Australian built boat outline warped from a distant spec to filling our windscreen now, our pilot pitched up a notch, clearing the ship’s structure, and waved with his right hand. 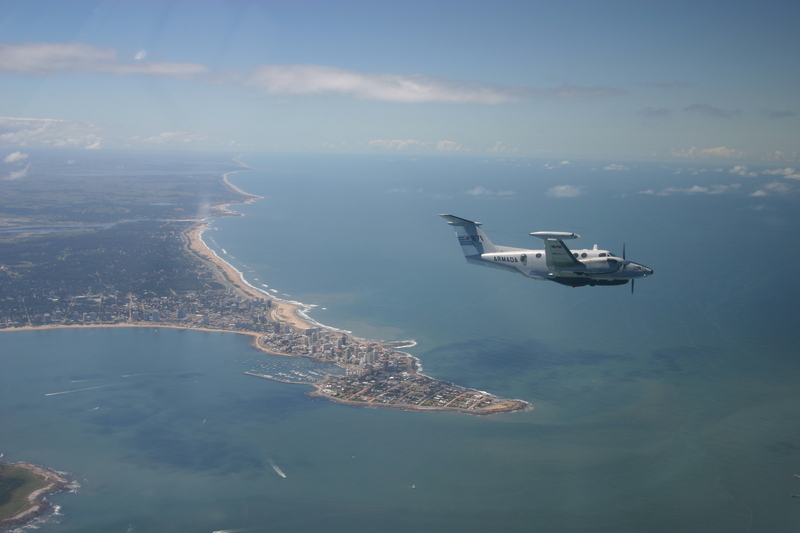 The farewell from Uruguayan waters with a fly past by the world’s first armed and “navalised” Super King Air, tail number Armada 871. This Super King Air is the larger brother to the popular US built King Air model 90, celebrating its 51st birthday this year. 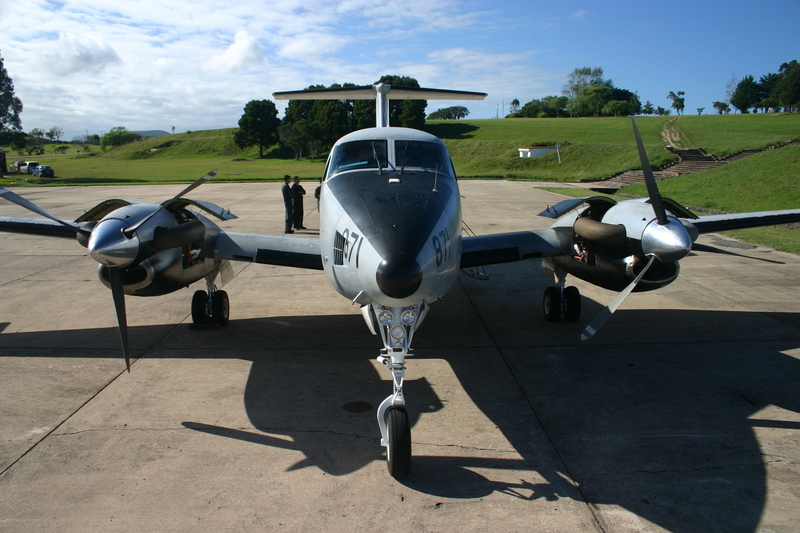 The twin turboprop first flew from Beech Field runway in January 1964 and was revolutionary for its time. It allowed personal and business users to operate a single-pilot, turbine- powered, pressurized, air conditioned and heated aircraft soon gaining a reputation as a “go anywhere, do anything aircraft”. 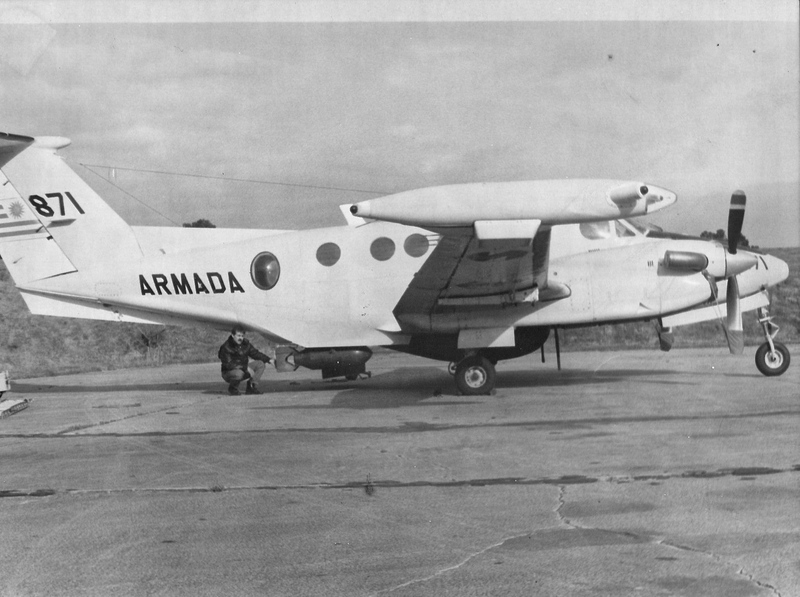 Armada 871 started life in 1978 on the US registry as N2067D (c/n BT-04) as a maritime patrol derivative of the King Air 200 series twin turboprop. 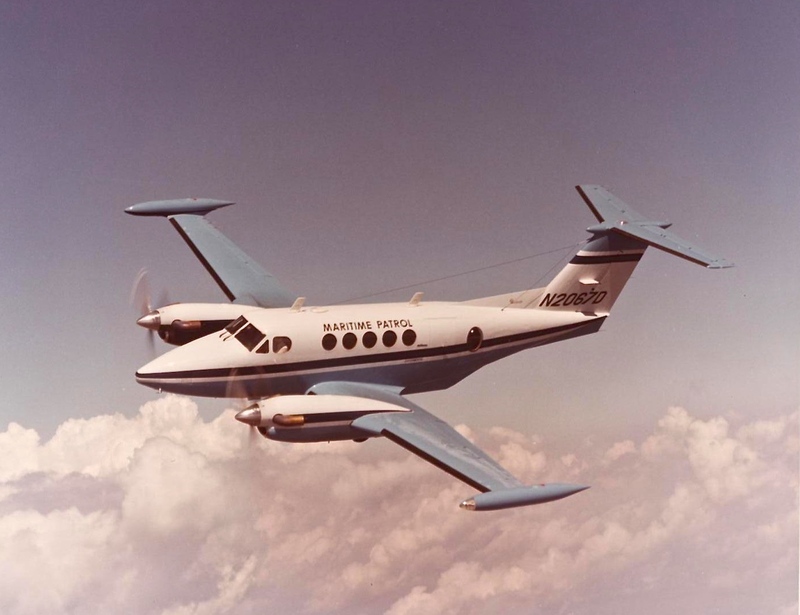 It was the factory demonstrator for the Beech Aircraft MRS (Medium Range Surveillance) concept (Raytheon bought Beechcraft in 1980).The Aviación Naval Uruguaya bought the aircraft to assist its Grumman S-2A Trackers and had it delivered on November 27, 1980. Of the five Trackers – three S-2As and two S-2Gs – that saw service with the force, one of the S-2Gs, Armada 854, is still on the strength of the unit. In storage, could be returned to flight at short notice should the need arise. The Beech 200T is powered bytwo 850 shp (634 KW) Pratt & Whitney PT6A-41, a new T-tail, tapered outer panels wing (Naca 23018 -also fitted on the US Army C 12s) and streamlined 41.63 imperial gallons (50 US gallons) wing tip tanks for increased range and endurance. Total fuel capacity of 541.23 imperial gallons (650 usg) provides a range of 1600 nm or to remain on station for more than eight hours, one and a half hour longer than civilian models. A 500 lb bomb (227 kg) installed under the ventral hatch! The external wing sections have been toughened to install two under-wing hard points to support loads of up to 140 lb (63 kg) per station. These can carry a variety of weapons including M30 100 lb (45 kg) general purpose bombs, MK 23 practice bombs (eight can be fitted on a Mk47 bomb rack), an FN Herstal 7.62mm TMP (twin machine gun pod) on each pylon (these are interchangeable with the ANU’s Beechcraft T-34C1 trainer/attack aircraft, the armed version of the Turbo Mentor). 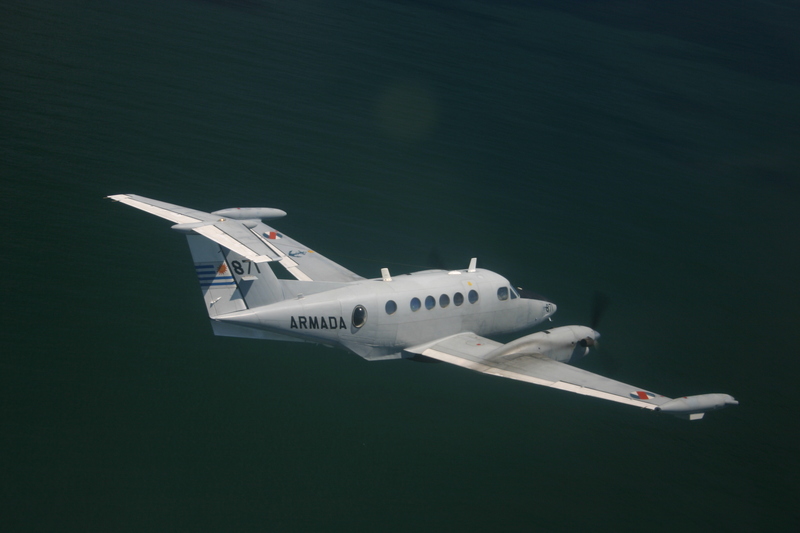 Able to be installed on the underwing hard points of the B-200T is the Argentine built ARM-657 “Mamboretá” rocket launcher with its 57 mm “Aspid” rockets. Six-tube ARM-657-A Mamboretá rocket launchers can also be fitted to the pylons, but only five ASPID high-explosive 21/4in (57mm) rockets can be fired from each – the tubes adjacent to the engines are left void due to their proximity to the propeller disc. 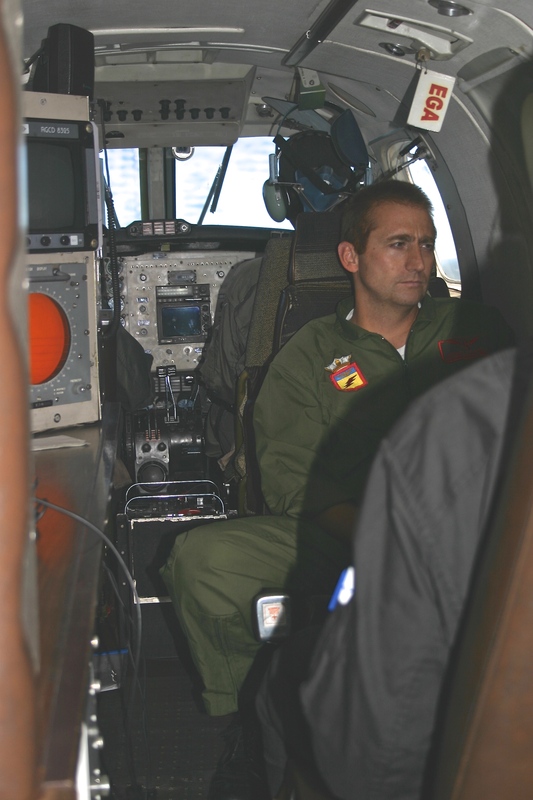 Weapons aiming is achieved by a rudimentary vertical, ball tipped, metal rod, fitted externally over the nose of the aircraft in front of the commander’s seat. The correct speed and altitude for weapons release must be flown and a reticle (grid of fine lines) on the windscreen, must be aligned with the aiming device. Weapons launch/release is a two-man operation, the co-pilot activates a CB (Circuit Breaker), the captain then selects ‘Master Arm’ switch to ‘On’ and presses the trigger on top of the control column. 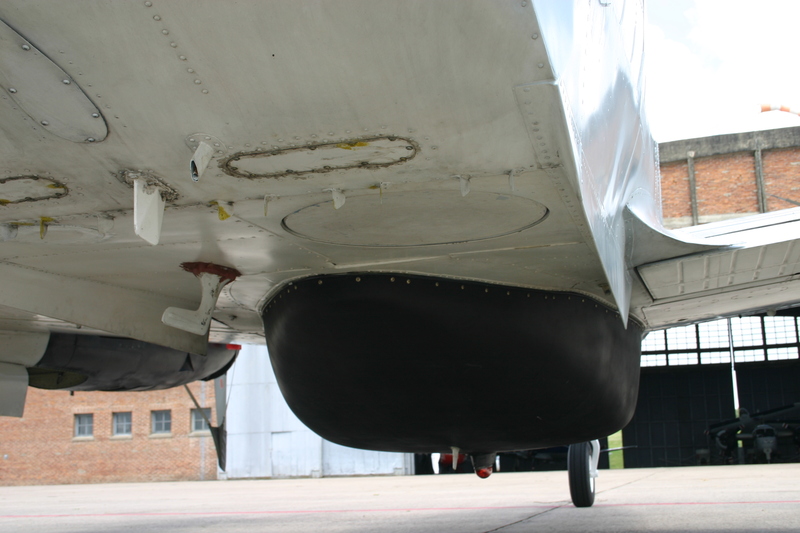 An indigenously designed electro-mechanical external weapons release can be fitted to the ventral hatch for dropping 350lb (159kg) and 500lb (227kg) AN-M64 general purpose bombs. 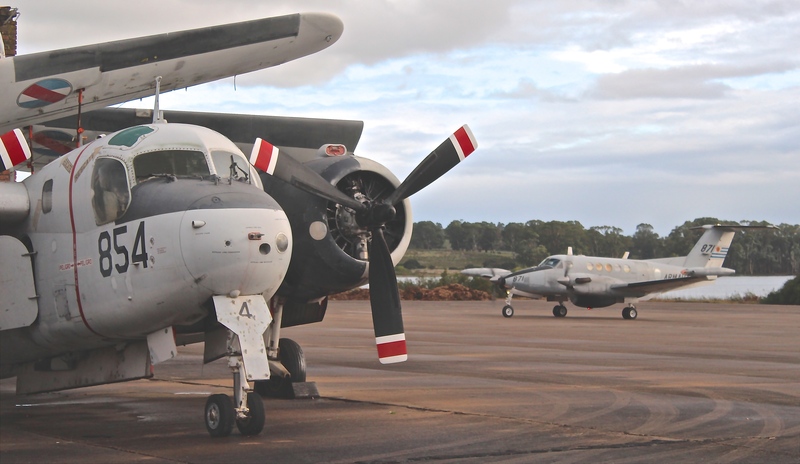 The latter – dating from World War Two – are possibly from stocks that armed the Aviación Naval Uruguay’s Martin PBM-5S-2 Mariner flying boats in the ’fifties. Following all these modifications weight went up by 1500 lb (682 kg) above civilian versions to a mtow of 14000 lb (6364 kg), placing the B-200T on a multiple airworthiness certification (FAR 121.187) in both normal and restricted category (the latter applies when above 12.500 lbs [5682 kg]). 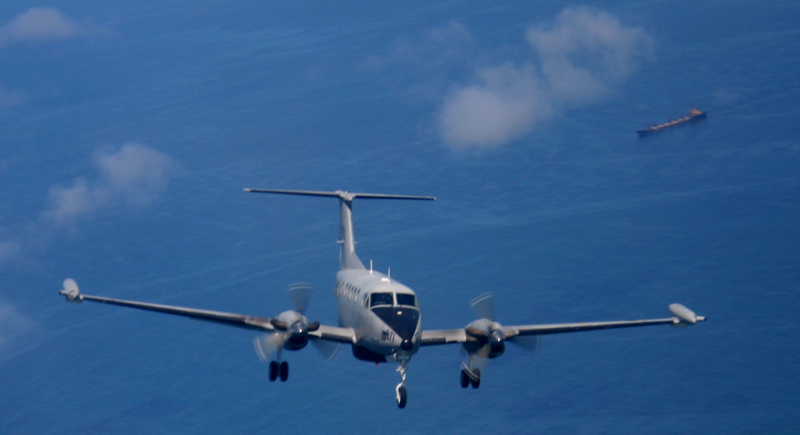 To practise weapons delivery (on oil drums targets) the B-200T regularly deploys to danger areas D16, located over the Atlantic Ocean south of the port of La Paloma, and the overland D8 adjacent to the Laguna Garzón (Garzón Lake) both 20 minutes flying time east of BAEN 2. The aircraft has only once fired its weapons ‘in anger’. This was on February 26, 1995 when it was tasked to sink a decommissioned World War Two Cannon-class destroyer, the ROU (República Oriental del Uruguay) Uruguay (former-USS Baron). It achieved success with two salvos of ASPID 21/4in rockets, hitting the ship below the water line. Two large dome-shaped observation windows were fitted on either side of the aft cabin giving the aircraft the looks of a two-eyed monster. After these changes the aircraft was designated Super King Air! The aircraft has a 31,000 ft (9500 mt) certified ceiling, and the pressurised cabin, low noise levels, provide a fairly comfortable environment. Propeller auto feathering, Collins FCS-80 autopilot and flight director plus a WX Narco 58 weather radar, help to decrease pilot workload. Accurate navigation over large expanses of water is crucial so two GPS are installed. 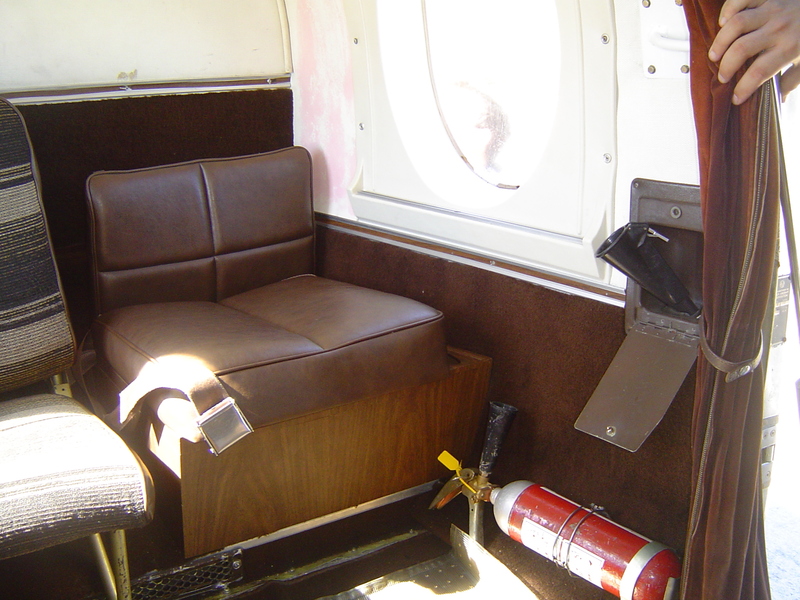 There are five cabin seats, including a belted one doubling as a toilet (without partition as on civilian models) certified for passengers during takeoff and landing. 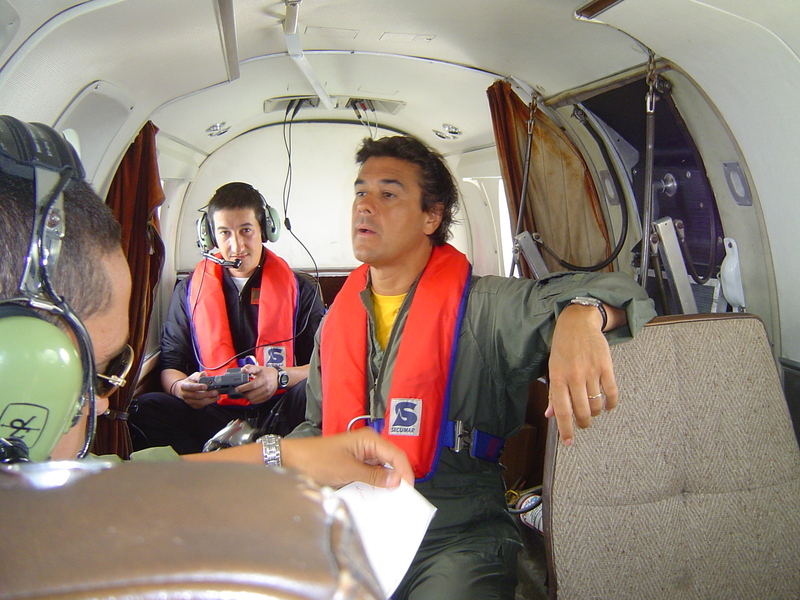 Leveling off at 5000 ft, Hugo sets 1700 rpm for the cruise giving us a 477 lb (202 kg) fuel flow per engine as we follow a westbound GPS route parallel to the coast towards the nation’s capital Montevideo. 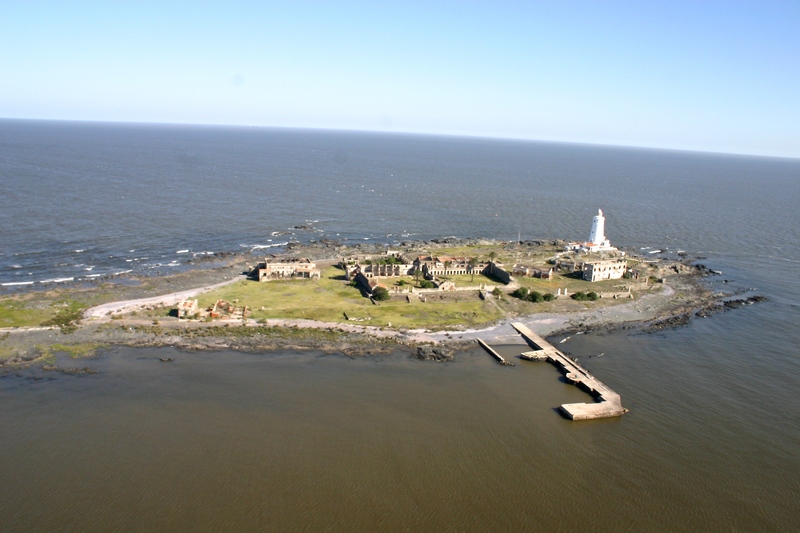 The Rio de la Plata, treacherous to navigate due to its natural hindrances (deep, rocky shallow bottom, sand banks, stony peninsulas and islands) has through the centuries acquired a reputation of asailor’s grave (the inception of the GPS soon ended that status!) 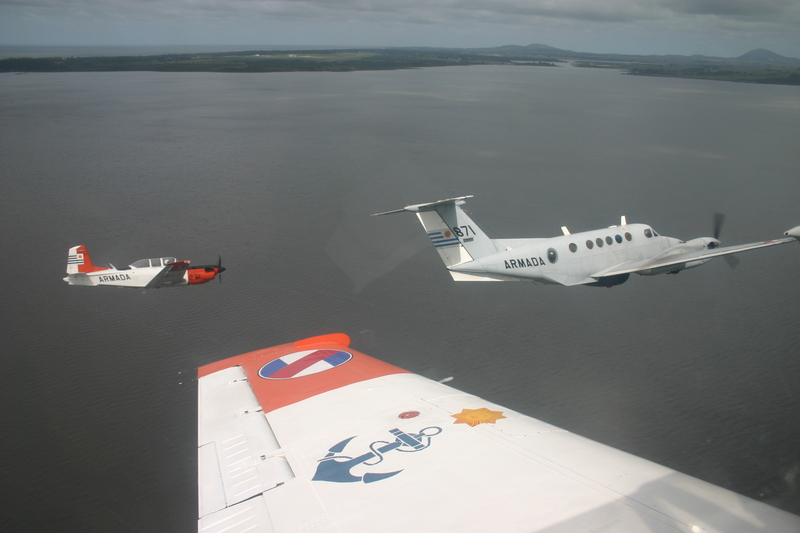 With a surface of 20.950 square nm (38.800 square km) and the widest mouth of any river on earth (125 nm/230 km) the waters of the estuary, plus its oceanic extension, are home to the ANU’s aircrews whose main tasks are to protect against illegal fishing, narco traffic detection, environmental/pollution control and SAR duties. Further challenges are afoot as the country surveyed the extent of its continental platform as to increase its Economic Exclusion Zone (EEZ) from 200 to 350 nm (370 to 648 km) from its coast. A serious responsibility for just two aircraft! 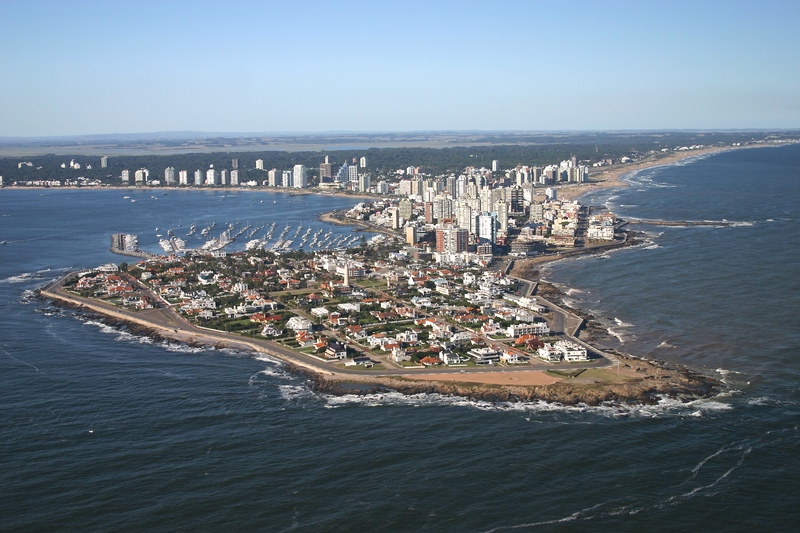 With a 15 kt tailwind our GS was 190 kt (175 kt) thus after twenty minutes we approached Montevideo. Whilst inside Carrasco CTR (the country’s main airport) within 8 nm (15 km) south from their VOR, the GPS indicates we are at 36 nm (67 km) from the contamination zone. 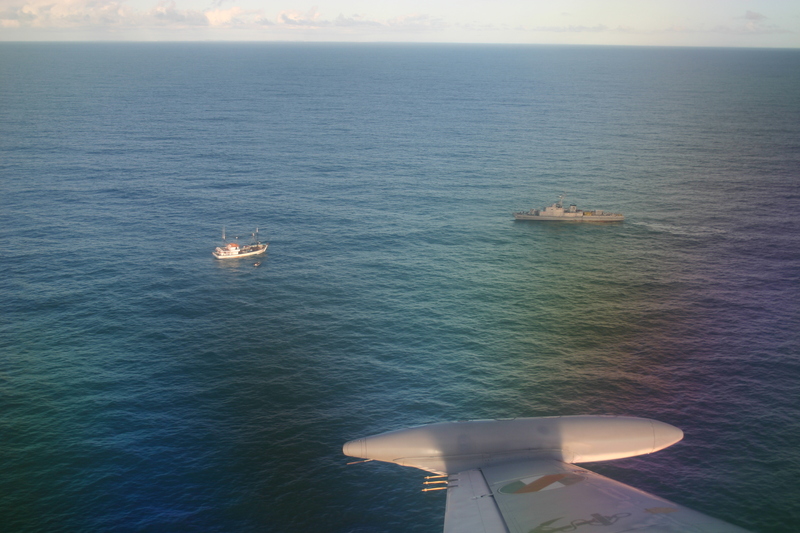 A few fishing trawlers carried out trapping manoeuvres and cargo ships waited to alight their loads. It was here during the dawn of WW2 in 1939, following the Battle of the River Plate, that Nazi Germany’s pocket battleship Admiral Von Graf Spee was sunk by her captain after being damaged by Royal Navy ships. However one of the main obstacles to sea navigation was right under our aircraft: Flores Island, six miles off the coast with its old lighthouse and many mysteries having served as a quarantine station for European immigrants in the 1800s, a prison early in the 20th century and even as bombing range for the Navy. South from the island lays the Banco Inglés, a sand bank with dozens of shipwrecks. Such vast amount of metal is deposited underwater here that the navy practised the art of submarine hunting by aiming their S-2 Trackers’ MAD (metal anomaly detectors) to the sand bank as they overflew it during high tide! 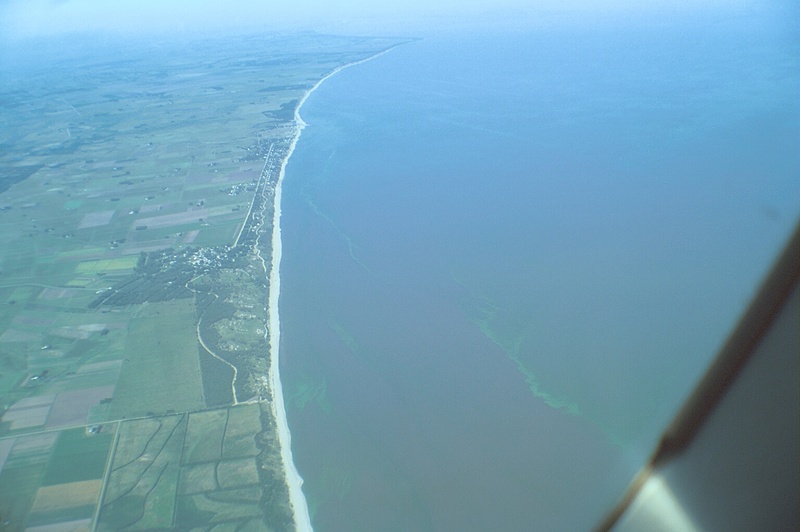 Approaching Juan Lacaze, isolated green stains appeared on the water. Hugo begins a step descend for closer view down to 50 ft (15 mt) at 180 knots. 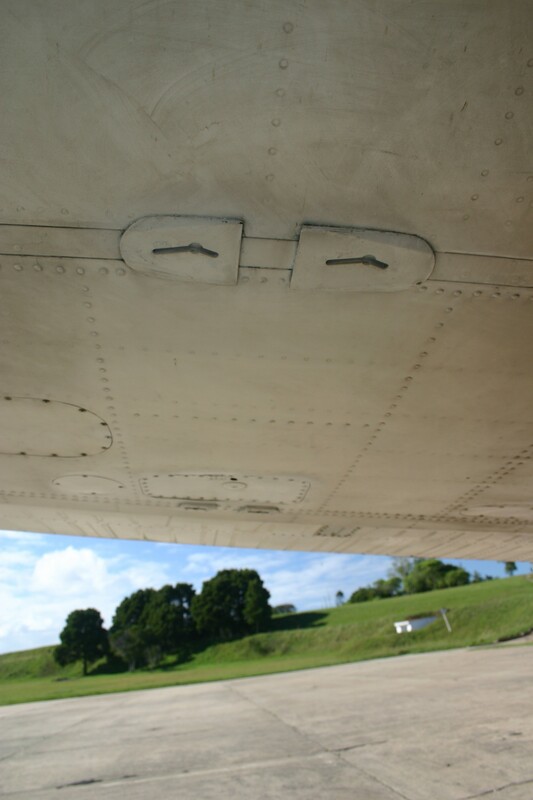 The aircraft felt stable solid with crisp handling supplied by the mechanical control surfaces. Flying being done manually, the autopilot is disengaged below 200 ft (61 mt) via a paddle switch on the control column or by operating the electric trim. The result: truly interesting hands-on, low flying an upward looking, scary anglers! Albin got busy filming the algae spread whilst Victor contacted coast guard posts passing on location details to warn bathers. 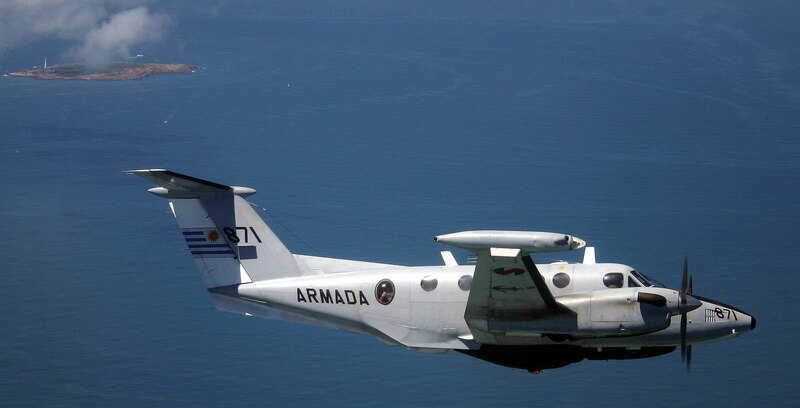 Armada 871 two main weapons: the Telephonics AN/APS-128 surface surveillance/weather radar housed on a ventral radome and the Israeli built Elisra AES 210 passive listening ESM (electronic- support- measures) equipment, both systems being capable of 360 degrees search patterns. 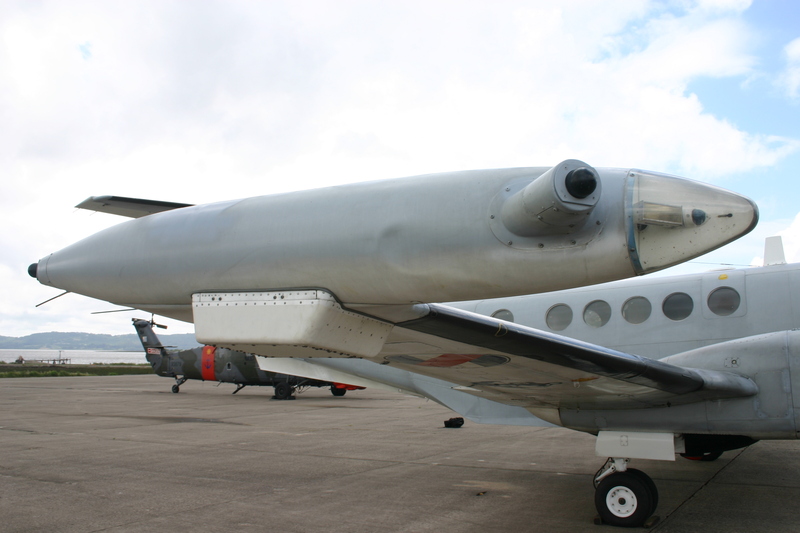 To diminish the negative effects of the turbulent air- flow generated by the AN/APS-128 ventral radar dish, fins at either side of the lower fuselage were installed. Apart from its tactical value, the system can also be used as weather radar, having a range selection of 25/50/125 nm (46/92/231 km). 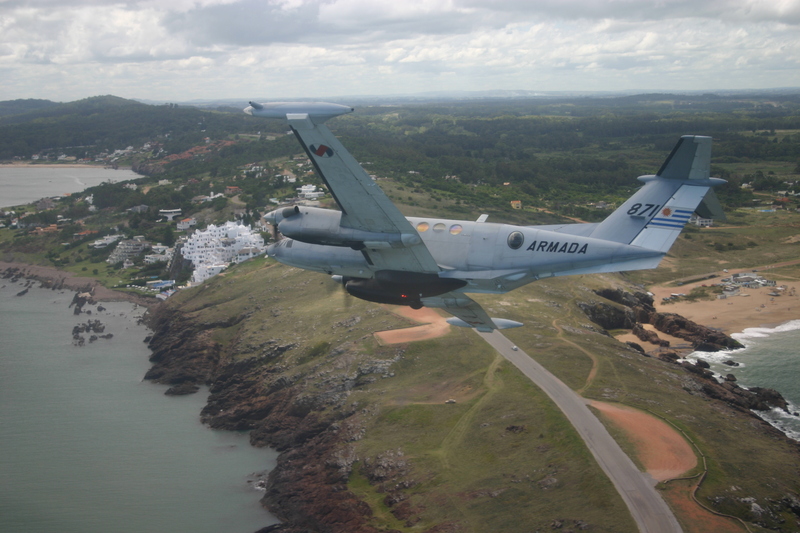 The Elisra AES/210 fitted in Uruguay in 1993 (Gonzalo and Hugo trained in electronic warfare in Israel) has flat rectangular sensors placed below the wingtip tanks and amplified the capabilities of the aircraft. 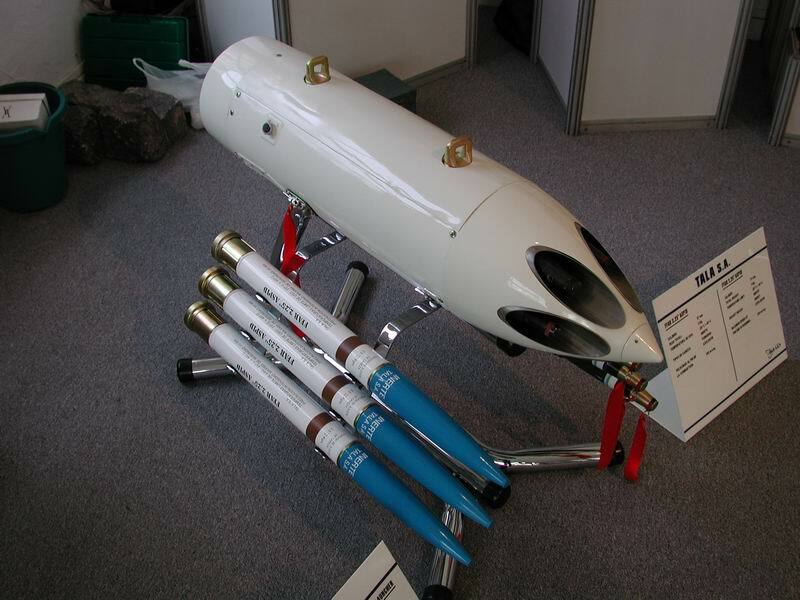 The compact, lightweight system serves a range of applications, including air, sea and land surveillance, ELINT (Electronic Intelligence) information gathering, targeting and location finding of enemy radars and platform self-protection. It automatically detects, measures and identifies radars -down to the name of the ship transmitting the signal – (ground-based and ship borne weapon systems) calculates their location and provides radar warning to aircraft pilots. 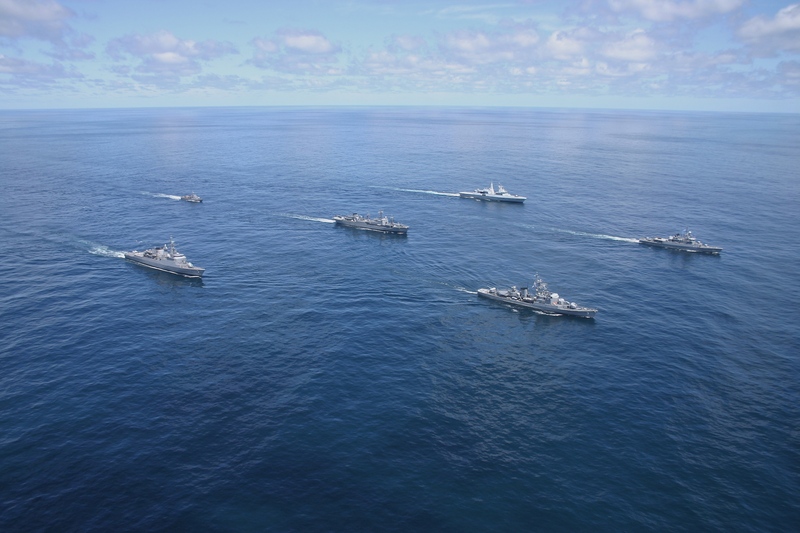 A data link allows the position and speed of vessels to be transmitted to surface stations and Uruguayan Navy frigates, effectively providing the latter with an over the horizon attack capability. Intercepted emitters are presented to the operator on an interactive colour graphic display – also records and stores data enhancing the probability of future detection supported by a database of known hit/signals (a bonus as Elisra provided an empty one). 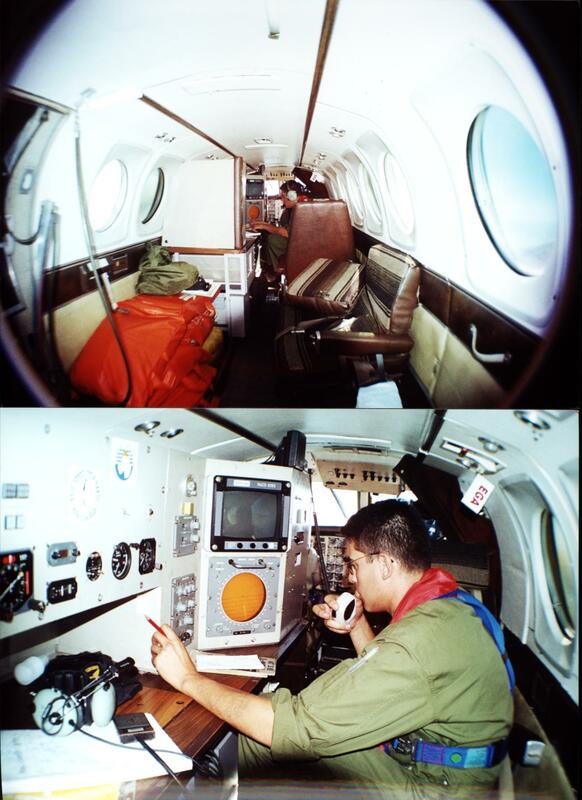 For its search and rescue (SAR) role a Skymaster II Unipack ten-man life-raft can be dropped from the under-wing pylons or from a hatch in the floor of the cabin. 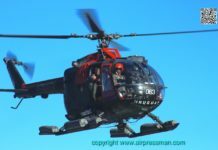 SAR missions are normally flown at heights of between 300-500 ft (90-150m) in daylight and around 3,000ft (915m) at night. The life-raft can be dropped at a height of 75 to 250 ft (23 to 76m) and speeds from 60 to 240 kts (110 to 440 km/h). 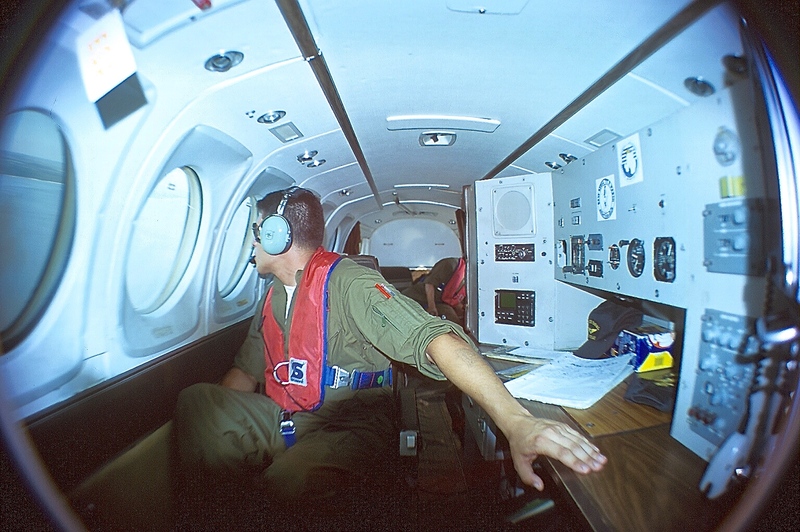 Night operations are limited as the cockpit is not NVG (night-vision goggle) compatible and the aircraft lacks a search light, however, a flare launcher can be attached to the under wing stations. 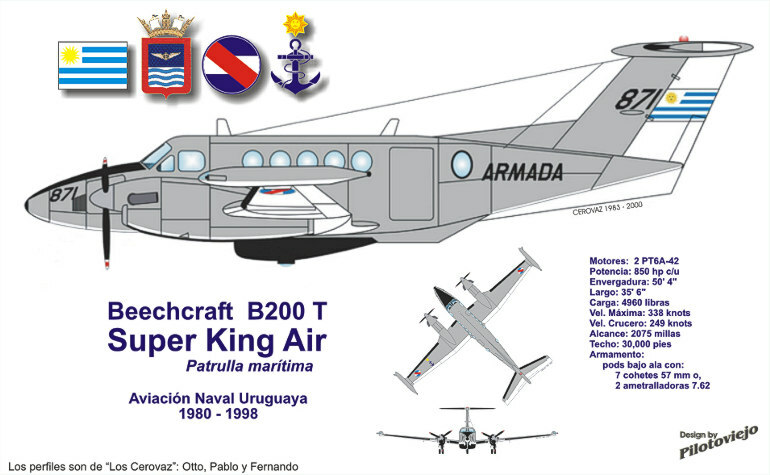 The B-200T was a regular participant of the Atlantic phase of the joint naval war games Unitas, carried out yearly amongst the US and Latin American naval forces, as well as Salvex (a liaison exercise with Argentina and Brazil SAR co-ordination centres) and Polex, a pollution control exercise. 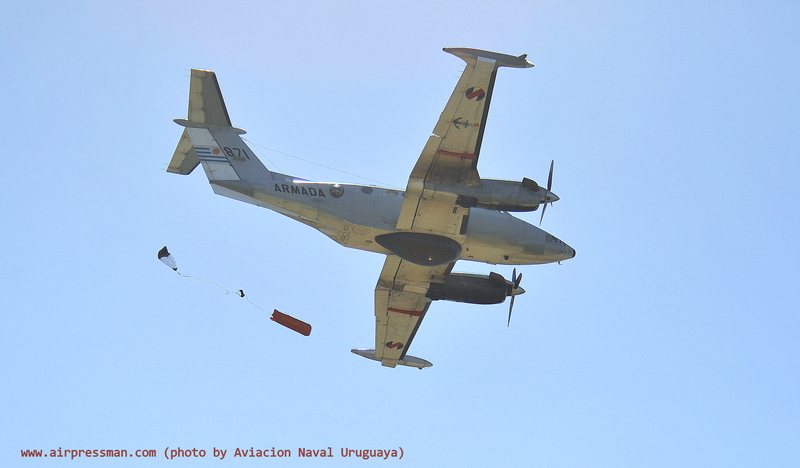 On a previous Unitas exercise, Armada 871 was positioned to Comandante Espora NAS in Trelew, home base of the Argentine Navy Escuadrilla de Vigilancia Marítima equipped with P-3 Orions and B 200M (the latter, kitted up with Uruguayan assistance, to mirror the B200T capabilities). 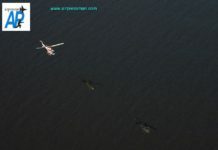 The aircraft backed up a team of surface and air assets, on a “Free play” -simulation of real threat exercise – exercise tasked to identify foe surface units and pass on their location to friendly forces. Other tasks included SAR and ship formation photography with seven hour long patrols flown at 200 kt cruising speed, up to 160 nm (296 km) from the coast at altitudes between 1000 to 5000 ft (as optimum altitude for radar utilisation for the threat is an important consideration). 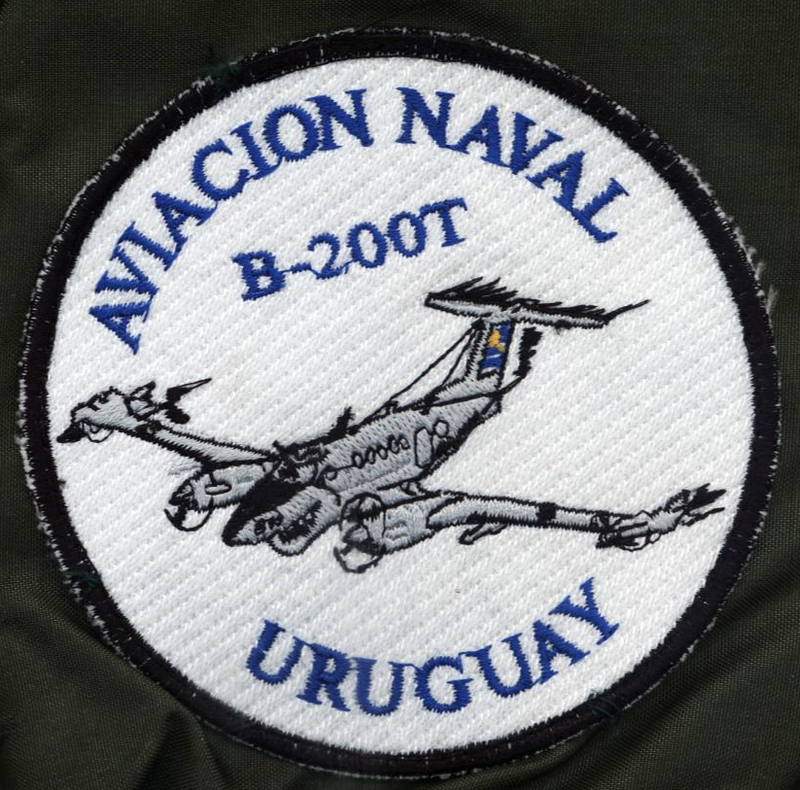 Attacks to opposing surface ships by Argentine navy Super Etendard and Aermacchi 329 jets were carried out guided by ANU’s crews, enemy position reports from GPS readings provided to the attack planes. 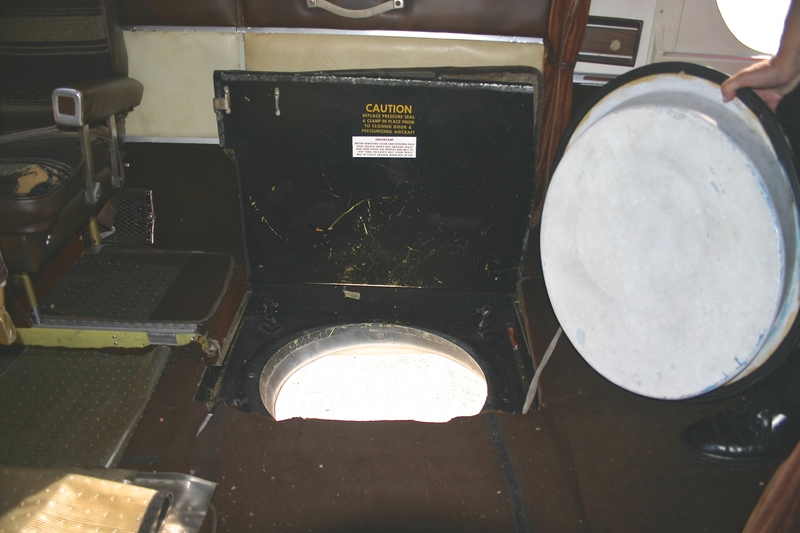 No INS kit is fitted to 871 during the early days of this aircraft a Omega control unit was visible on the radar operator’s console. The VLF/OMEGA system is no longer available, an old station in Argentina, (plus eight stations on the southern hemisphere) and a total 18 worldwide, decommissioned by their creator and former largest user the US Navy. A serious SAR incident occurred on August 5th 2000 when a Panamanian registered ship, the “Skyros”, collided against the “ROU Valiente”, sinking the Uruguayan Navy mine sweeper in South Atlantic waters. 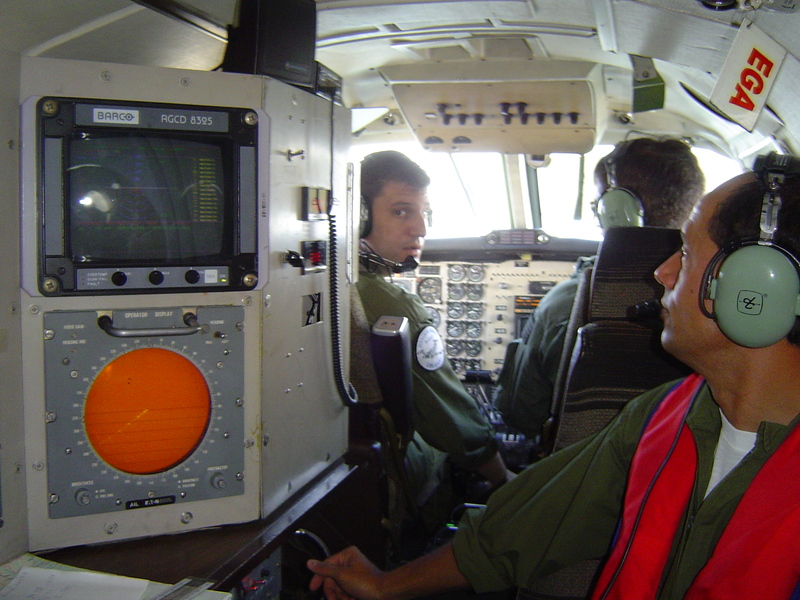 Armada 871 was first at the scene, becoming a communication platform reporting on wreckage location, allocating flight levels and information to all the rotary wing elements dispatched (both by the ANU and FAU – Air Force) Naval HQ and civilian ATC. This conduct was extremely important to avoid further accidents, controlling the natural human reaction to rush and help, without a proper action plan, during disastrous times. Tragically, eight people died on the “Valiente”. Hugo Martini was in command of 871 and received a medal for his actions. 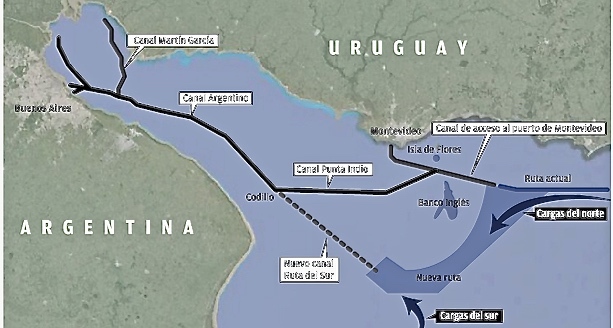 Uruguay’s main headache in the maritime arena is the custody of its EEZ (Economic Exclusion Zone) where it estimates that it loses approximately £40 million ($80 million) per year through illegal fishing in its waters and this may increase if plans to increase its EEZ from the 200 nm (370 km) at present, to 350 nm (648 km) from its coastline are approved later this year.Further duties include the environmental control of its waters, observing and photographing ships illegally discharging harmful substances, as well as SAR duties. At 50 ft (15 m) over maldonado Bay. 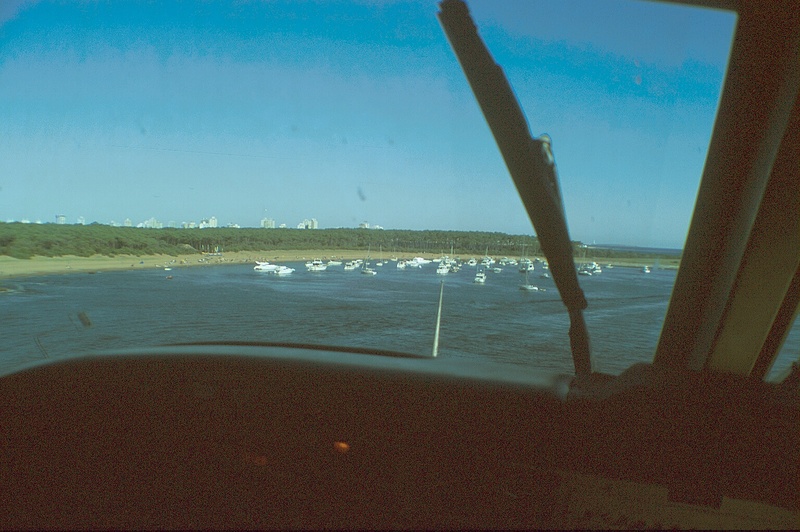 Gorriti Island opposite Punta del Este ahead, with Honda Beach lee and pleasure ships’ peace about to be disrupted by two PT-6s!!! Landing back at Curbelo the three bladed Hartzell props brought us to a speedy slow pace with their pitch at minus 9 degrees. Its low stall speed (77 kt with full flap) and low- pressure tyres, makes it suitable for unprepared fields. After more than five decades of King Air service, the type is ubiquitous, proven, and extremely reliable. 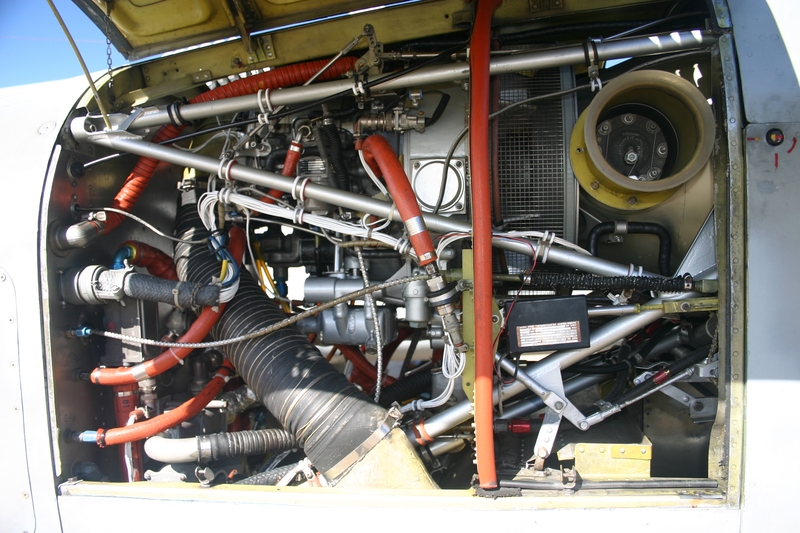 It is easy to operate, maintain and spares are plentiful. In light of the service phasing out from duty of the old antisubmarine S-2s Trackers, the service has lost its anti-submarine warfare (ASW) capabilities. These could be reinstated, ushing Armada 871 as a platform, by equipping it with an ASW suite and sonobuoy launcher. 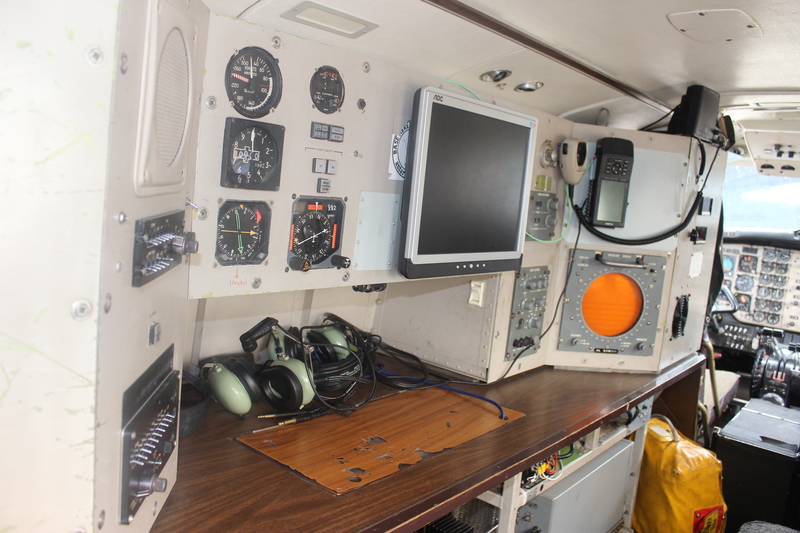 Its crews are still taught the art of ASW, and tactics are practised in Uruguayan- built simulators at the Escuela de Aviación Naval (Naval Aviation School) at BAEN 2. 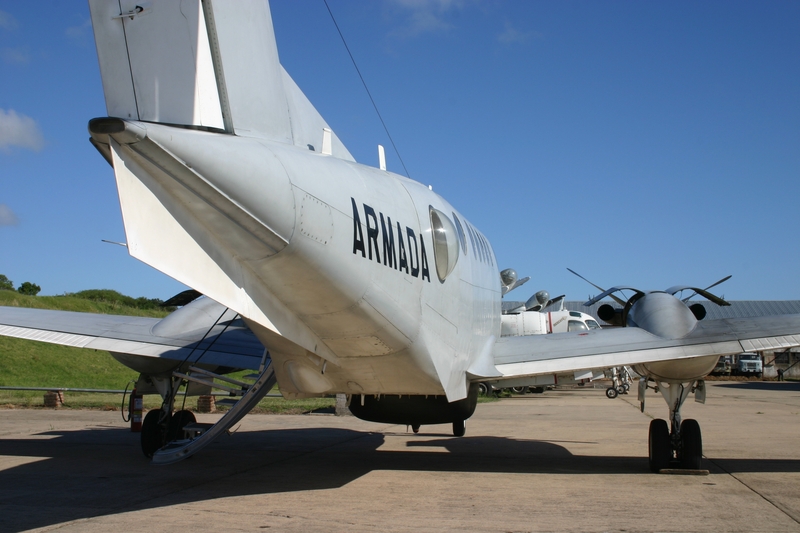 Since 1980 Armada 871 has been an undeclared “flagship” and ambassador for the Uruguayan Navy. The plane is so versatile that has at times been a presidential aircraft, a visitor to Antarctic stations and has save many lives when used in the SAR role having achieved over 9000 flying hours. In short an extremely able and gallant defender of the Plate! 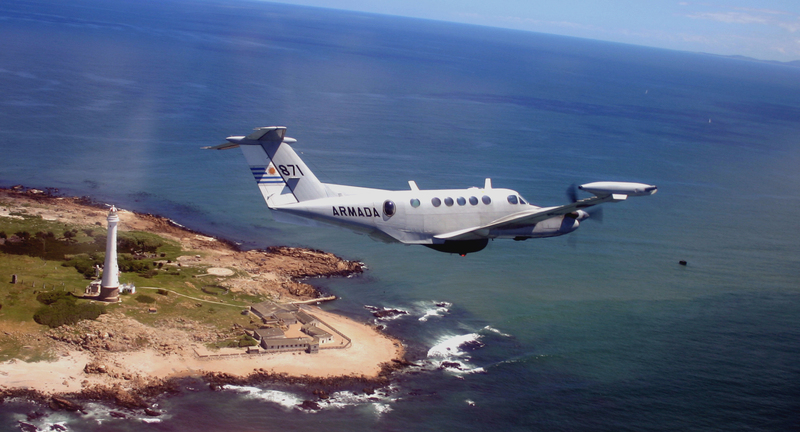 The Aviación Naval Uruguaya has officially introduced a recently bought Beechcraft B-200 Super King Air. 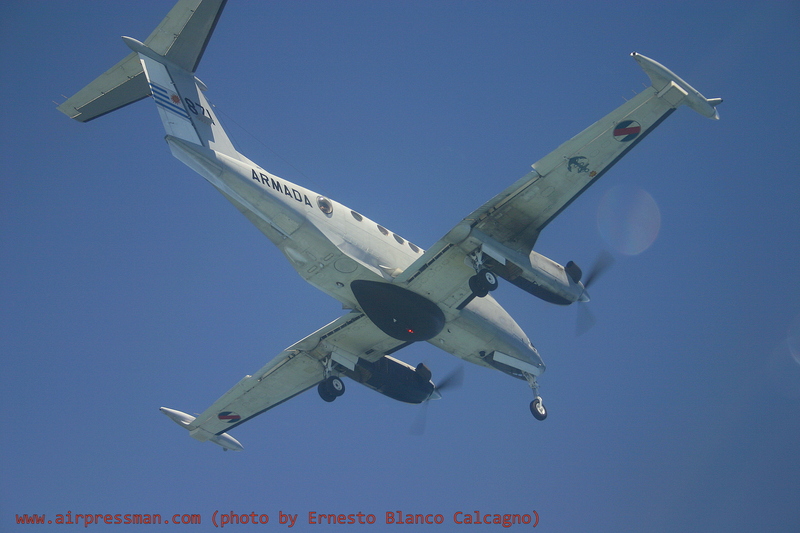 The aircraft previously a Swiss Government aircraft and of late US registered (N200NA) was obtained from the firm Inter-Kommerz for U$ 1.400.000. Designated as Armada 872 it bears similar characteristics to the service single B200T Super King Air, titled Armada 871 and will mostly be utilised for pilot training and transport, allowing the older B200T, fitted with a full suite of electronic detection equipment, to fulfil its main task as a maritime patrol aircraft (MAP).The ANU awaits financial resources in the medium term to equip Armada 872 with electronic equipment to assist in the surveillance and ESM roles. A news snippet, as published by Airpressman on UK magazine Air International. 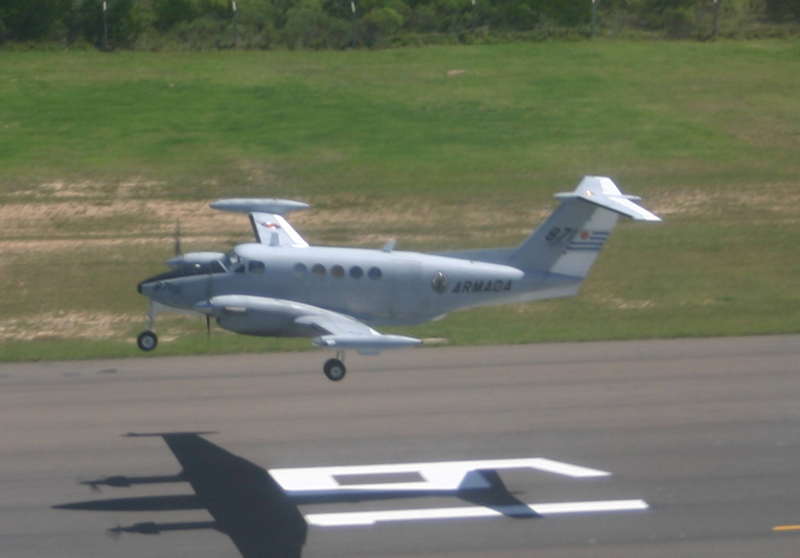 On Wednesday May 21, 2010, the Aviacion Naval Uruguaya (ANU – Uruguayan Naval Aviation) Beechcraft B-200T Super King Air (BT-4, ex N3067D c/n BB-408) returned home to the Base Aeronaval 2 C/C Carlos A. Curbelo (BAEN 2 – Naval Air Station 2) after an absence of three years and seven months. 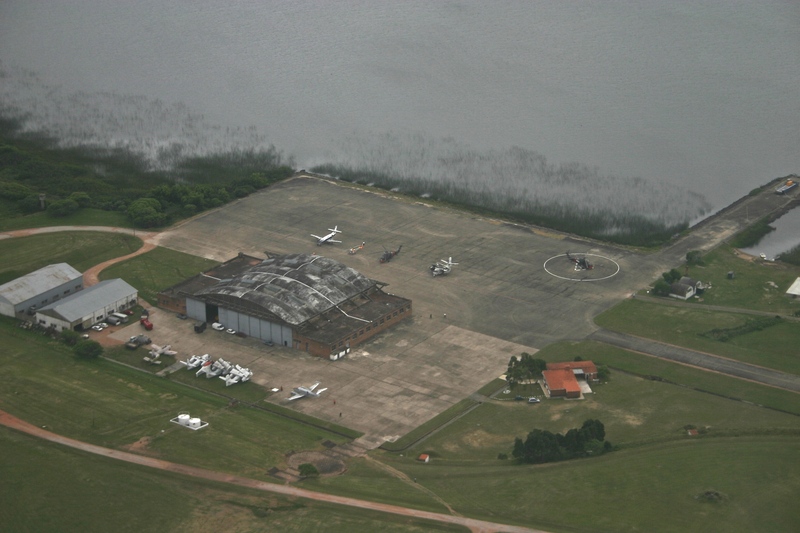 The aircraft, registered as Armada 871, suffered a main gear retraction whilst landing at Comandante Espora NAS, Bahia Blanca during a visit to Argentina on October 2006. 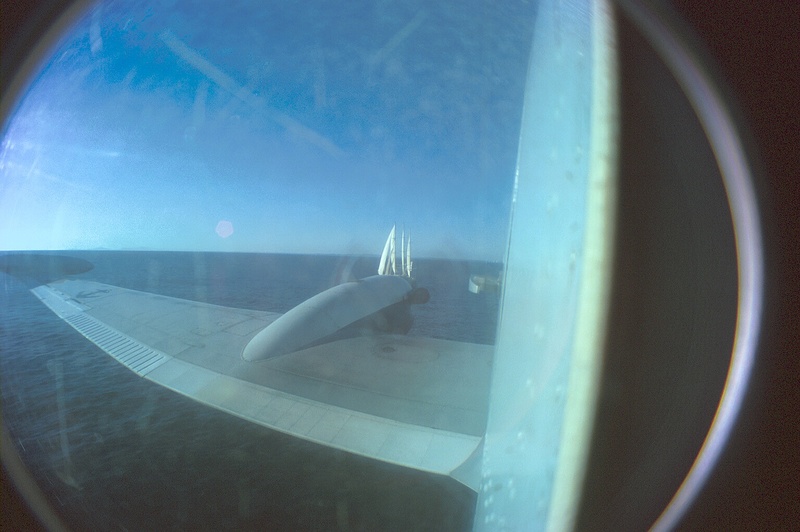 The aircraft underwent some damage to its right propeller, wing tip fitted Elisra AES 210 ESM suite antennae and its Telephonics AN/APS-128 ventral radome. 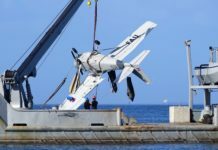 The repairs that normally would take up to three months to be completed were delayed due to financial and logistical difficulties, even whilst the Aviacion Naval was ably assisted by its Argentine counterpart. 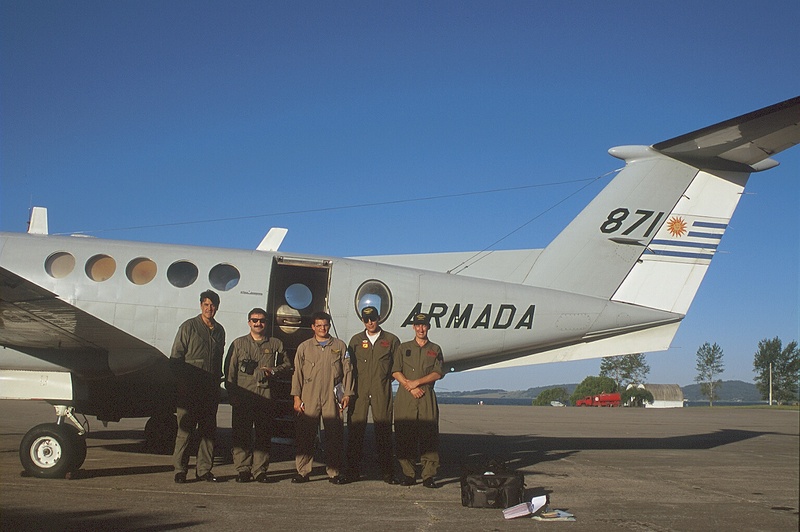 The B-200T was flown home by two ANU pilots (C/C Ernesto Larre and C/C Marco Suarez and Cpl. 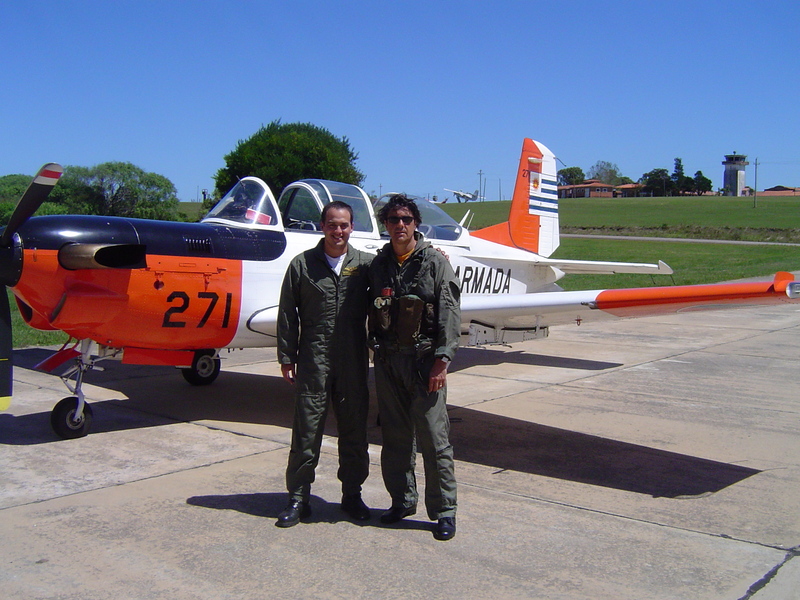 Carlos Alvarez as aircraft mechanic. 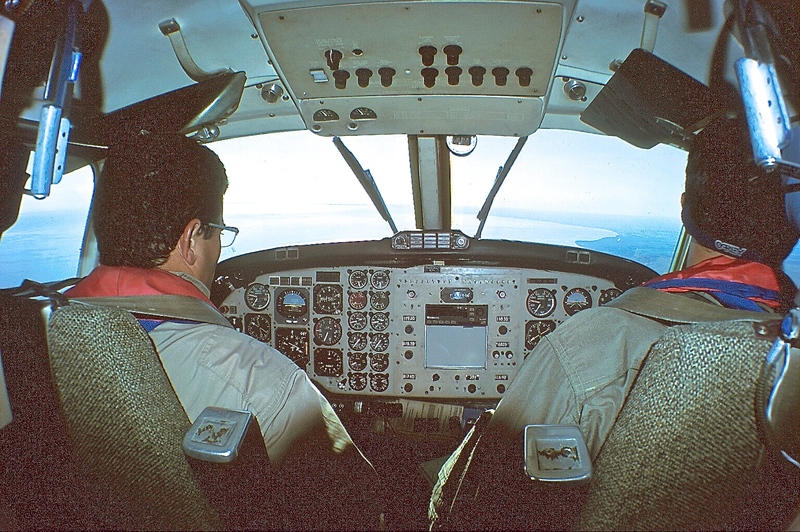 Both pilots re-qualified on type by flying similarly fitted Argentine Navy Beechcraft B-200M attached to Escuadrón Aeronaval No. 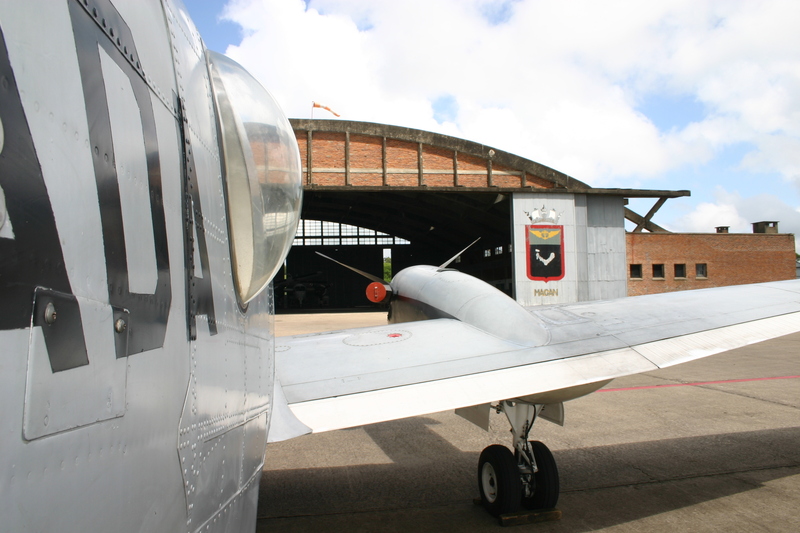 2 (Naval Air Squadron 2) based at Comandante Espora. (Includes start/taxi/climb/descend + 45 min. reserves. Fuel on main, auxiliary and tip tanks. 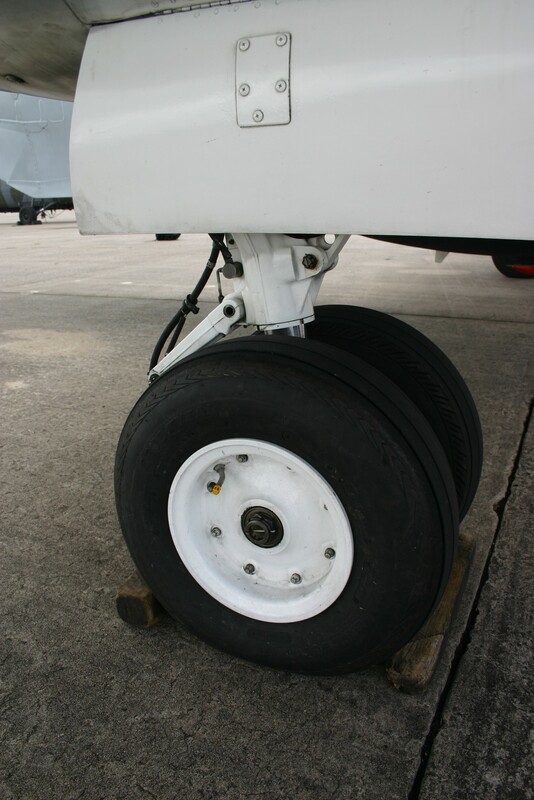 Useful load – 1343 lbs (Mission with 2 pilots, 6 pax and 323 lbs. load or bags).